2011– This is a style that I think I need to revisit again. I did my first attempt a while ago and I would need to tweak a few things. (I have been lazy and not tried it since then). 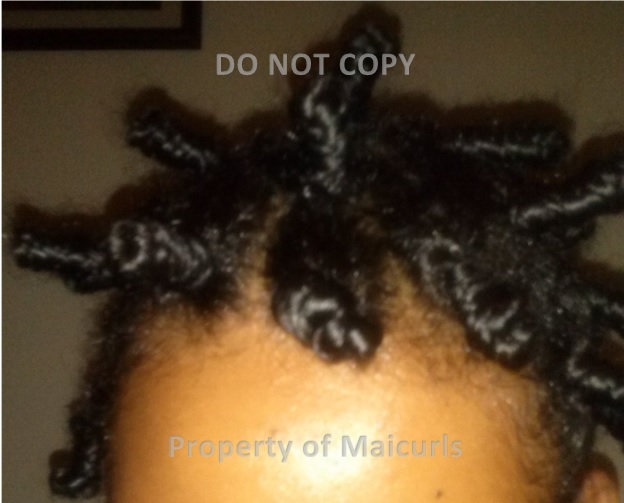 This is what the Bantu Knots looked like. (Excuse the shiny skin…the flash and light were a little too much). Instead of just wrapping my hair in Bantu Knots I would first do a two strand twist and then do the Bantu Knots. I would not make them stack up as much as I did. So basically instead of making them “tall” I would make them a little wider…wrapping around the base (if that makes sense). I would try on dry hair and just lightly spritz each section of hair as I twist and then Bantu Knot them. Because my hair was freshly washed it was still damp when I took them down. I slept with this! Yes!… Well I should say I tried to sleep with these on my head because of the fact that they were still wet so I could not take them down before bed (I do not use heat). I WILL NEVER LEAVE BANTU KNOTS ON MY HEAD OVERNIGHT EVER AGAIN. I did not have a peaceful night! I had to take them down the next day while they were still a little damp. This is what they initially looked like while I was taking them down (before separating them). There were really shiny but still somewhat damp. I thought I had images after I separated them but if I remember correctly because they were still damp it just did not end well :(. So I ended up just putting my hair up. So what I have decided is to revisit this with the above mentioned adjustments and once I do I will and my updated experience below this! *UPDATE – I have revisited this and had much better results this time round with a few tweaks… I think I could get even better results with practice. I did not want to remove the “Old results” I had in 2011 so I left this information on. For my most current attempt go to the bottom of the page. I used my DIY Leave-In Conditioner (to Moisturize) and then my Mixed Oils (to Seal) – I think I shall have to try with my Gel to get a longer lasting look. I did actually leave them in overnight – I wanted the Moisturizer to “set” the look but this time I left some space on the back of my head for me to sleep comfortably! Back – Space in the back for me to sleep comfortably! I might have been a little to fluff happy and separated them a little too much but no matter there is always next time! What about you? Do you do Bantu Knots and if so how? I would love to see images if you have any!